Sherman Lacrus led his team with 25 RBIs during the regular season. On Saturday night, he plated three more runs to help it reach the Arizona League semifinals. 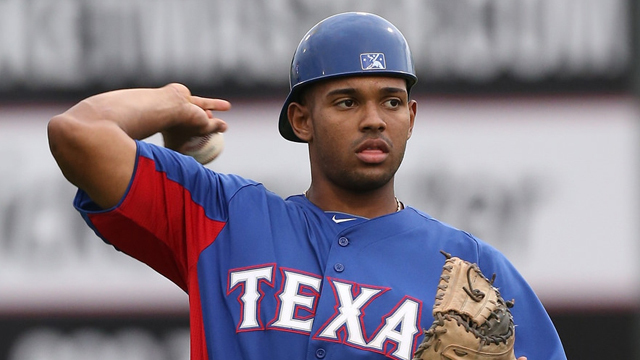 In a back-and-forth battle with the Angels, the 20-year-old catcher helped the Rangers post a 6-5, 10-inning victory. Lacrus snapped out of a 3-for-25 funk by collecting three hits and scoring twice in his regular-season finale on Wednesday. In the postseason opener, the Curacao native delivered an RBI single in the third to snap a 1-1 tie. The Rangers trailed, 3-2, heading to the ninth but tied the game on a run-scoring single by Elio Castillo and took the lead on Lacrus' two-run single. The Angels kept their season alive in the bottom of the ninth, but Oliver Caraballo led off the Rangers' 10th with a walk and scored the go-ahead run on a wild pitch by reliever Nick Wagner (0-1). Cody Palmquist (1-0) tossed scoreless innings to get the win for the Rangers, who will face the Indians on Sunday. Cleveland's AZL affiliate had a first-round bye after posting a league-best 20-5 record in the second half. In the other quarterfinal, Rayder Ascanio capped a three-RBI night with the go-ahead single in the bottom of the eighth inning as the Mariners edged the Dodgers, 3-2. Hersin Martinez matched Ascanio with a pair of hits for the M's, who will face the Giants in the semifinals. Ibandel Isabel singled twice, drove in a run and scored once for the Dodgers.